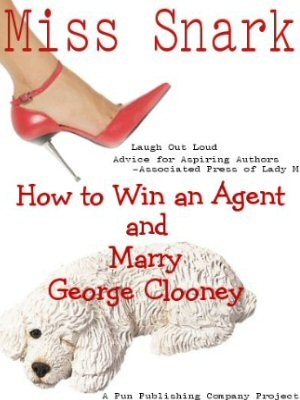 Miss Snark, the literary agent: Peek a boo, Agentbaby, where are you? Wonder how many e-mails you'll get requesting your info? "Thank you for answering my query so promptly. The attached information is what I was emailed. It isn't true. You emailed me back with valid support. Again, thank you. You just saved me from making a major mistake." "Here's an interesting thing about the Predators site. We can't find ANY contact information. Can you? So, here we have someone that purports to be an industry watchdog, that gives no contact information, or ability to discuss what they promulgate... doesn't that give you cause to question what THEY are saying? (We have had one author say they found a contact email, and we suggested that they ask Predators 'why? ', but they never got a response.. so... we suggest that you make up your own mind based on the professionalism of our interaction, with us, as real people, not some 'shadow' person/entity that is unaccountable. We've been at this for years, and we haven't changed our name or ran, we've stayed and fought, and the only real person that loses is the first time author that can't get the time of day from most agencies. Now, back to business." Preditors & Editors (tm), then ask Writer Beware or check Absolute Write's forum. There are others out there as well with information. Just don't accept only one source. What if they say that, due to client confidentiality, they'll only reveal a sales/client list when and if they make you an offer (which of course you don't have to accept)? Same dif or slightly different situation? meankitty, they're trying to outflank you with a response they have no intention of ever answering honestly, if at all. Frankly, kitty, I've strained my gray matter trying to think of a reasoning behind such a business practice (I know there are some agents that do so) and I can't figure it out. (Perhaps the agent deals primarily with the hiring of ghostwriters and so is contractually obligated to keep it a secret?) Even if it's an agent for a famous anonymous or pseudonymous work, all they would have to say is, "I agented TITLE" and that would tell you plenty. My agent, when informed that others followed this busness practice, was dumbfounded. An agent's best advertising is his other clients and what he's sold. What is to be gained from confidentiality? No one has ever given me a reason behind it. Fact: it is no secret which publishing house publishes a book. Fact: if someone is interested in obtaining some sort of subsidiary right to that book, they would be contacting the agent. I wouldn't even submit a query to an agent I knew nothing about. Mr. Kuzminski goes right to the heart of the matter in his last line above: Why contact an agent you know nothing about? In addition to the sources of info already cited, conference bionotes usually offer the agent's brag list of clients. These are worth Googling up. Some agents don't have a brag list. This doesn't make them bad agents--everyone has to start somewhere--but you should look for other bona fides. Are they junior agents who just joined a powerhouse agency? Do they have an extensive background in publishing? If you can't readily discover these things about them, then, to circle back to Mr Kuzminski's point, why query them in the first place? The key words in Mr. Isaak's comment are "brag list". It seems to me that agents would want to advertise their track record. Withhold the contact information, sure, but a list of names and titles should certainly be at the top of their list of marketing tools, wouldn't it? That's what shows how well they're doing their job. ANYBODY can be 'an agent' simply by announcing themselves to be so. So true. I am one of them...and I know of others. We come from many backgrounds, not just publishing. We are lawyers and counselors and teachers - all of whom have found a way to fulfill our own literary aspirations and goals. That being said, there are those who prey on the unwary, and I fully realize I will be lumped into that perjorative category until I have proven myself. When someone wants to know about my clients, sales record, or background, I'm honest with them. Prior to making a sale I told people where manuscripts were under consideration and I was more than happy to put them in contact with authors I was representing so, at the very least, they got a sense for how I treat writers whose work is entrusted to my care. I also do not hide the fact that my background is NOT in publishing. In addition to being an agent, I am also a writer and rely heavily on such sites as Preditors and Editors when seeking information. Perhaps this is why I'm okay with the idea that authors need to be cautious and why I DO NOT take their questions, however probing, personally. I am not yet a member of the AAR, another "warning sign," but I have chosen to adhere to their standards. One of the things I'm doing to educate myself in this business is to network with the people in it. One New York based agent took me under her wing recently (probably partly because she saw my potential and partly, I'm guessing, out of pity) to help me with any questions I may have. Another thing I think is extremely important is for my clients to be free to terminate their contracts with me for ANY reason. The bottom line is this -- if a potential client is concerned about anything we've been discussing here, then I encourage them to find an agent who will be a better fit. At this time, ALL of my clients have come through personal contact at conferences, critique groups, and speaking engagements. I do not intend to put up a website until I have a few more bragging rights under my belt. I think Miss Snark's advice is much needed and Dave Kuzminski's comments are a welcome addition to this blog. Just remember, not all red flags signal danger...but they can. New writers want someone to give them a chance. New agents want the same thing.